Life would have been so much easier if there were only one single tool to choose for cutting a tile, wouldn’t it? However, each power tool suits best for different types of tiles (porcelain, ceramic, mosaic, glass etc. ), so it’s important to know your requirements before buying a tool. 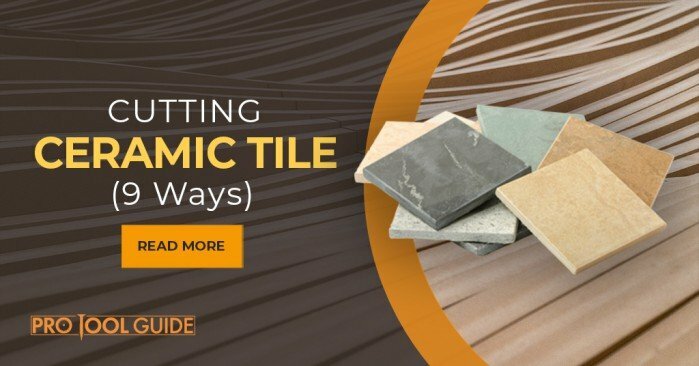 This article aims at guiding you about cutting ceramic tiles successfully to fill the awkward shapes that you always have left over when tiling. By the end of this guide you will be able to learn how to use different power tools that fit best for cutting a ceramic tile and make perfect cuts. Ceramic tiles comes in a lot of different styles, so it will surely help you make your flooring beautiful. On top of that, they fall in budget, are super durable and adds a great aesthetic value to your home. Ceramic tiles including the earthenware, stoneware or porcelain tiles are hardwearing materials which are why they are used for dado walls, rooftops, table tops and various other purposes. In cases where they are being used as construction materials, most of us will confront the need of cutting them at some point in time. You can use different tools for cutting a ceramic tile. It is just like glass, so when pressure is applied on the cleanly scored surface, the ceramic tile will easily break into pieces. 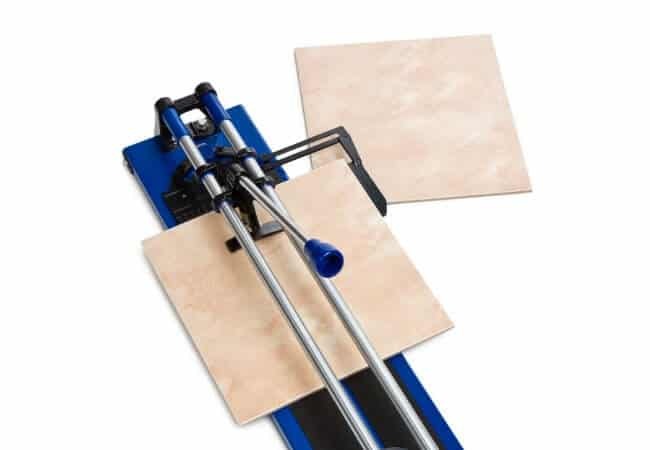 A snap cutter and a wet tile saw are the two main power tools which can be used to cut a ceramic tile. 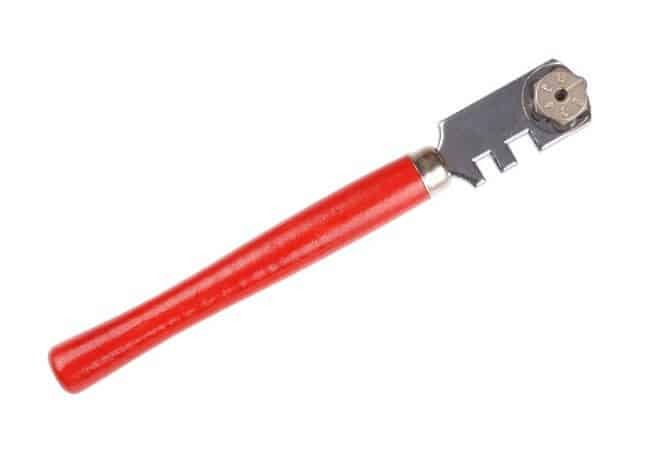 If you are looking for a budget option which is easy to carry out the task as well, then you should go for a snap tile cutter. It is also known as a rail cutter and works similarly to a glass cutter. It has a carbide wheel that is slowly pressed along the tile to score. A manual snap cutter comes in really handy for making straight cuts. If you want to make a perfectly straight cut, the manual snap cutter is what you’re looking for. Handy as it is, it is a worthy investment as it only ranges around $200 (decent quality) and is available on any home improvement online portal or shop. To use the snap cutter, initially, you have to prepare the tile and mark the line. After marking the line, place the tile firmly against the front guide, lift it and depress to score a straight line. After scoring, depress the handle in order to snap the tile in two pieces. If you’re cutting ceramic tile (more than one), clamp the fence into the same position as the first cut and place the tiles succeedingly. However, you should brush the debris away after you’re done with the cutting procedure. But most of the times we want to make irregular cuts across the edges rather than the straight cuts. In such cases, using an efficient tile nipper is beneficial as the snap cutters can’t make the irregular cuts. Also, known as the nibbling tool, it can be used to make a half inch or an entire inch distant cuts from the edge by making the scoring lines. This tool is also used to make notches or tiny cutout. The best part about the nippers is that they are relatively chip ranging from $10-$25 based on their quality. However, the drawback of a tile nipper is that the cuts that are made using it are not as clean, unlike the rest two tools. To make a cut using the tile nipper, initially use a snap cutter for scoring the lines. After scoring, nibble the tile chips one by one slowly from the tile area that is to be removed. Removing larger bits will shatter the entire tile and therefore, patience is what you require while nibbling the tile away. The precision of tile cuts are made using the wet saw, but one has to be experienced to use the wet saw. Wet saws are largely available in different models, different sizes both for renting and owning. Therefore, find a prominent home improvement center or portal to purchase a budget priced wet saw which can be available for around $60. In case if you are looking for a wet saw that can handle the bulk job, get a professional one which costs around $500. The tile saws come with pumps which squirt water on constant basis onto a sharp diamond blade. Inexpensive saws do not have any pumps but have the ability to keep the made submerged. It’s a mandatory to have a splash guard for the wet saw if you want to use it in the indoor environment with the help of scattered spray. However, using it outdoors is recommended because of the dust and splatter it delivers. In case if you want to make curvaceous cuts, employ a radial arm wet saw. 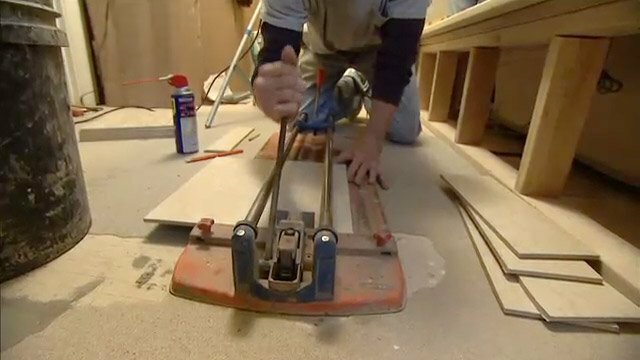 To cut a tile with a wet saw, initially set it on a smooth surface. If the saw comes with a pump, put the pump in a pan and fill the pan with water. Test it and make sure it’s functional before proceeding to cut in a way that it supplies water stream to the diamond blade. If your saw doesn’t have a pump, fill the pan to a certain level such that the blade stays submerged in water and keep filling the water after every 20 cuts. Now, take a marker and mark the tile on the surface in the shape you want to make a cut. To make straight lines, place the tile on the tray pulled away from the diamond blade. Turn on the saw, hold the tile rigidly against the tray, slide it and let the blade cut the tile. To make angle cuts, switch to the protractor like mode and cut notches by making small and parallel cuts that are around 1/4 inch distant. Take a tile nipper and finish the work by nibbling the chips away. If the task is small and doesn’t involve any curvy or complex cuts, you should use a glass cutter. It can be found anywhere in the nearby local tool stores or even online for a very low cost. 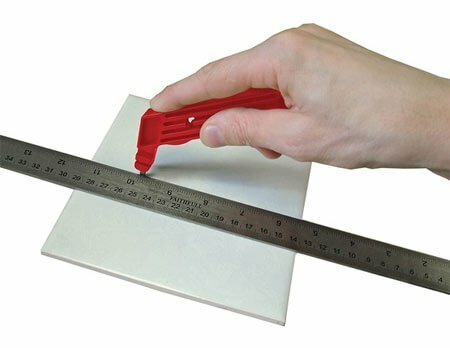 Measure & Mark: By aligning the horizontal edge to the bottom of the tile, measure and use a pencil to mark the area where you want to cut. Position & Score: Place the tile down on a robust surface (a plywood suits best), move the square cautiously and keep it a little off the marked line. Now press down the glass cutter and move it along the marked line by using the square as a reference. Snap Tile: Place a wire hanger along the marked/cut line and press down on the edges until the tile snaps. Smoothen: You want to smoothen out the edges whenever you cut a tile since the sharpness would be dangerous. Rub the edges across a brick or a rubbing stone to do so. Another tool you can use is an angle grinder (4-inch) with a stone blade. It is helpful to make angled cuts. The cuts will not be as cleaner as you get using a wet tile saw though they would be fine. Around the doorways and heater vents, you can make rough cuts quite easily. What if you want to create a hole in the center of the tile or make cuts on the edge? Well, there is a solution! A rotary cutting tool or RotoZip can be used to make such cuts (such as circles for pipe insertion) or any shape. It has a blade that works similarly to a drill bit and moves super quickly. The bits cut through the ceramic tile. It doesn’t cut straight lines too well, but can fulfil the duty of a tile nipper easily. They are on the expensive side but can be used for a lot of remodelling jobs at home. The most basic method of cutting tiles (particularly straight cuts) is using a tile scribe. It has a tungsten carbide tip which allows it to score almost on any tile. You can either use a drill or a masonry drill to cut holes in ceramic tiles. First you need to drill small holes along the diameter of the hole you wish to cut and then cut along the edges using a tile saw. At the end, you can use a tile filer to smoothen the edges. A jigsaw can also be used to make cut in ceramic tiles. It works best to make notches and angled cuts in the tile. A tile cutter helps to make straight cuts however at times, the requirements might be different (smaller, slanted or notches). Here’s where the jigsaw shines with it’s diamond blade. To be honest, it’s not a tough job to cut a ceramic tile. All you need is the ability to measure precisely and have proper focus. Without the need of any expensive tools, you can finish the cuts in a couple of days. Using any of the above three methods, you can succeed in cutting ceramic tile without any obstacles. Based on your requirements, budget and also the type of cut you want to make, use a suitable tool and make a ceramic tile cut. If you have any doubts regarding the usage of any tool, approach in the comment section for further guidance. Share this guide if you think it is helpful and have a good day! It’s interesting to see that ceramic tile can be cut with wet saws in order to prevent dust from spreading. We happen to have a lot of ceramic material that we want to use to make an outdoor walkway. I think that we should work with a ceramic cutting service to make sure that each piece is cut to an exact specified size.